You've heard the refrain, and it's a noble one: "Eat like a local." But what if you want to be an unapologetic tourist and try an Arizona restaurant you've been hearing about for years? There's a reason these places are famous, right? So go for it. This edition of "Eat Like a Tourist" takes us to Scottsdale. Elements' executive chef Beau MacMillan catapulted to culinary stardom when he defeated Iron Chef Bobby Flay in the episode "American Kobe Beef" on the Food Network hit series, Iron Chef America. Since, he has appeared on several of the network's other popular shows, including The Next Iron Chef and Best Thing I Ever Ate. 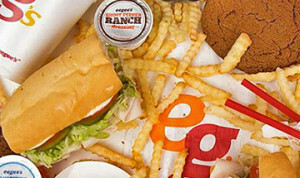 Plus, MacMillan has prepared meals for celebs ranging from hockey star Wayne Gretzky to pop music icon Britney Spears. The menu at Elements showcases his masterful talent in dishes like Korean BBQ short ribs and jidori chicken with white-cheddar grits. Sample these as you soak up stunning views from the floor-to-ceiling windows. 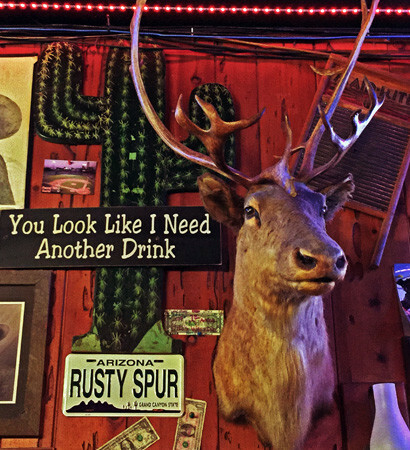 Horseshoes, old-school beer signs and bar stools reminiscent of the lower half of a scantily clad cowgirl decorate Scottsdale's oldest saloon, where locals and tourists alike flock to hear live country music seven days a week. If you want to two-step the night away, you can fuel up with half-pound burgers and locally made tamales, washed down with cold bottled beers from a former bank vault—now a refrigerator. While you dine at this Scottsdale hot spot, keep an eye on the swinging doors. Over the years, John Wayne, Clint Eastwood, Jennifer Aniston and Toby Keith have all moseyed in. 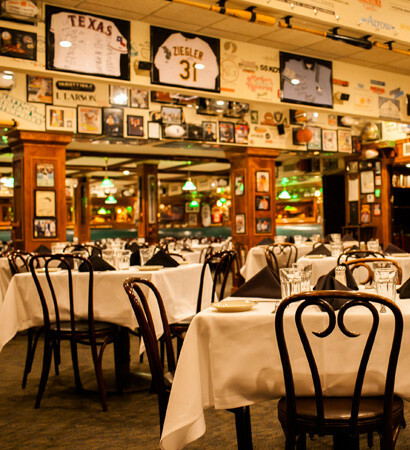 The aged, corn-fed prime steaks, fresh fish and juicy burgers with hand-cut fries are the stars of the lineup at this classic Chicago-style chophouse opened in 1981 in Scottsdale. But it's the sports memorabilia that draws fans, professional athletes and their coaches, especially during Cactus League Spring Training. Look for baseballs signed by greats like Babe Ruth, Willie Mays, Joe DiMaggio and Reggie Jackson in the glass case along one wall. Signed magazine covers, caricatures, jerseys and other memorabilia pay tribute to sports legends beyond baseball. Diners in the know consider Old Town Tortilla Factory's 1,400 square-foot flagstone patio one of the best for an alfresco dinner in all of greater Phoenix. Shaded by century-old pecan trees during the day and illuminated by string lights dangling overhead at night, it feels a million miles from the bustle of the nearby Scottsdale Arts District. Adding to its appeal, the restaurant serves complimentary house-made tortillas with flavored butter and features 190 premium tequilas on its menu. Southwestern favorites include a red-chile pork chop with ancho-raspberry sauce and margarita chicken stuffed with cheese and roasted peppers. Since opening in 2009, FnB has garnered accolades from the James Beard Foundation, The New York Times and Food & Wine magazine, to name a few. The outstanding food has earned Chef Charleen Badman a James Beard Foundation nomination for Best Chef in the Southwest every year for the past five years, and under beverage director Pavle Milic's direction, FnB received a 2017 James Beard Foundation nomination for its wine program. Not to mention, nearly every major local and regional publication has recognized the Scottsdale restaurant for its outstanding achievements. Arizona native Teresa Bitler writes about food, travel, culture and adventure. Everyone keeps telling Arizona visitors to eat like a local, but what if you want to be an unapologetic tourist? 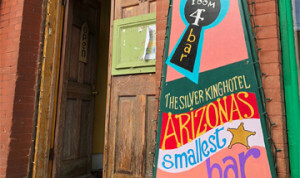 Here are 5 legendary Arizona restaurants to try in Tucson. Biggest, smallest, best, spiciest. We distill Arizona's restaurant scene in this wild roundup of foodie superlatives. Life is more fun with your four-legged cuddly companion by your side. 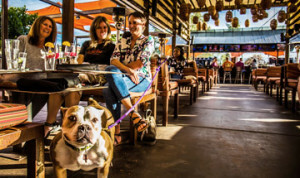 These 5 dog-friendly Arizona restaurants couldn't agree more. Copyright © 2019 Expedition Foodie.